Romando Vigil Tse Ye Mu was born on January 23, 1902 (coincidentally, Feast Day at San Ildefonso Pueblo) and passed away in 1978. He was educated at Santa Fe Indian School, and spent a large part of his adult life working at Walt Disney Studio as a (self-taught) painter. 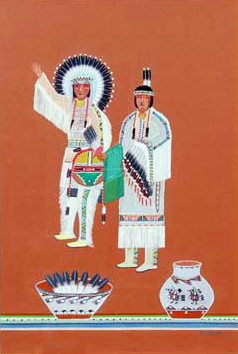 A leader within the San Ildefonso Watercolor Movement, Vigil used a stylized design to represent his chief interest in painting native ceremonial dance figures. He was a master at creating stylized images with a simple line. His work was neatly executed, often without background or foreground treatment. His coloring was usually very good. 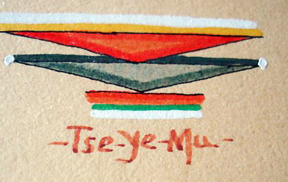 (Tse-Ye-Mu, Falling in Water) (San Ildefonso). One of the artists most infuenced by Oqwa Pi's bold coloring and less restricted approach to subject matter, Vigil was well-known for fanciful, abstract figures that seemed to float in midair. His style lent itself especially well to murals, and he did work in a number of Santa Fe public places. He moved to California later in life, and his painting tailed off.